The views from Chilcabamba Ecolodge are dominated by the impressive snow-capped volcano of Cotopaxi, the second highest active volcano in the world. This is a destination for lovers of the great outdoors, with opportunities for hiking, mountain biking, horse riding and bird watching, plus the chance to go climbing in Cotopaxi National Park. While at Chilcabamba you can also visit local communities to learn about daily life in the Andean Highlands. Rooms are rustic in style with ceiling beams, tiled floors and wooden furniture, as befits a mountain lodge. All have an en-suite bathroom with running hot and cold water, and the wood-burning stove makes the room especially cosy on cool evening and mornings. Large windows let you admire the alpine views from the privacy of your room. There are some suites which are slightly larger with an indoor sitting area. There is an open plan lounge-restaurant in the main lodge, which, like the chalets, is largely built of wood, and has hand embroidered cushions and colourful rugs which give it a homely feel. You can enjoy local specialities and international dishes in the restaurant. The food is wholesome and tasty, and much appreciated after spending time outdoors. Open: Chilcabamba Ecolodge is open all year. Location: Chilcabamba Ecolodge is in a valley in the Andean highlands, at an elevation of almost 3,500ms, and within sight of the impressive Cotopaxi Volcano. 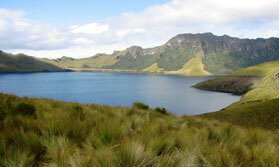 It is about 73kms south of Quito, approximately a 2 hour drive. Rooms: All 14 guest rooms and suites, which are slightly larger. All have comfy beds, tiled floors, picture windows, colourful curtains and bed throws, and rustic wooden furniture. Fuel burning stove provide ample heat on cool mornings and evenings. The en-suite bathrooms have hot water showers. Suites have a sitting area. Activities: This is an outdoors destination, ideal for hiking, mountain biking, horse riding for experienced riders and beginners, and bird watching, all led by local guides from the town of Pedregal. Cotopaxi National Park is just a 5 minute drive (6kms) away, with opportunities for hiking and climbing. You can visit a local village and learn about the Andean lifestyle and even have a go at milking a cow by hand or try out your cheese-making skills! There are monthly photographic safaris. Cookery classes can be arranged. On clear nights Chilcabamba is an excellent place for star gazing. Facilities: There is a large sitting room with views of Cotopaxi. The lodge has a bar. There are gardens. A laundry service is provided. Dining: Meals are eaten in the dining room which seats up to 40 people. International and local dishes are available. Breakfast consists of fresh fruit, bread and cereals. Children: Children of all ages are welcome. The lodge can arrange family-orientated activities. "Wonderful atmosphere and views The log fire always crackling in the room upon our return. Great WiFi!"